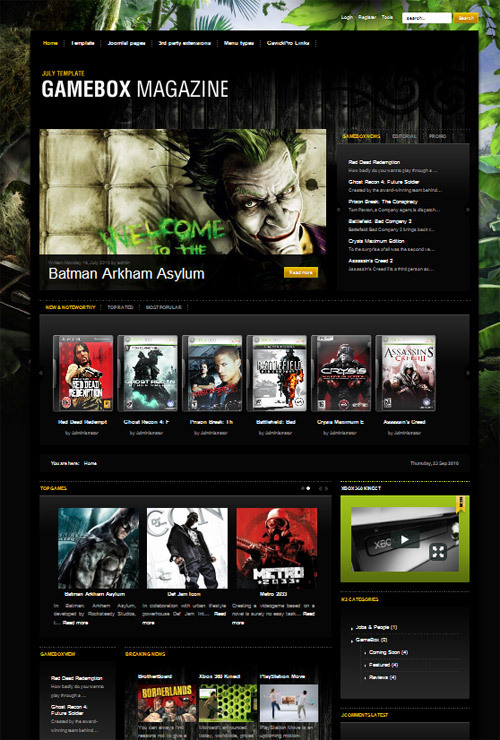 GK Gamebox Magazine - Template Developed by GavickPro (July 2010). Template created for submission games. Everything from a variable background image to specially selected modules will help you to create your own game online magazine. The template GK Gamebox Magazine actively use new technologies, such as Google Chrome Frame and Cufon Fonts. It is based on a new version of T3 Frameworks v2, developed by studio JoomlArt. A large number of technological developments do not cumbersome template. It is easily loaded and thus has a modern appearance and functionality.